It's impossible to visit Morocco and not eat couscous - it's the staple food of North Africa. Although it feels like a grain, and is often treated as such, it is in fact made up of tiny balls of semolina, millet or barley dough. As well as being an ingredient in other recipes, it also lends its name to a dish of its own, in which it comes topped with a rich stew. 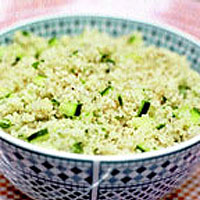 It is traditionally cooked in a two-tiered couscoussier in which the couscous is steamed over meat and vegetables. Deseed and chop the cucumber. Toss it in some salt and leave to one side for 30 minutes. Then soak in a bowl of fresh water for 5 minutes; repeat this with a further 5 changes of water until all excess salt is removed. Drain and set to one side. Mix the couscous, 5 tbsp oil and salt. Rehydrate the couscous according to the instructions on its packet. Alternatively, you can just place it in a bowl, pour over some boiling water to cover, then let it sit under a plate until the water's absorbed, finally fluffing it up with a fork. Stir in the cucumber and parsley and add the remaining 2 tbsp olive oil.